The Battle of the Somme fought in the Picardy region of Northern France between 1st July and 18th November 1916 was one of the largest British battles of the Great War and nearly a century later is one of the great symbols of that conflict, right or wrong. The battle cost the British Army more than 450,000 casualties and while historians still argue over whether the Somme was a victory or not, pressure on Verdun was relieved by the Somme offensive, the German line was broken and pushed back some way, and the last of the German ‘field army’ died in the trenches of Picardy; a battle that cost them even more men than the British. 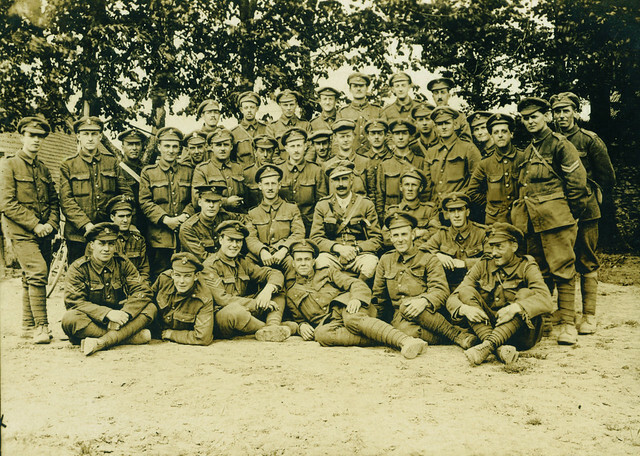 During the ‘Big Push’ every regiment of the British Army and all of the major Commonwealth nations fought on the Somme, among them the men of the Royal Fusiliers pictured here. This image is dated June 1916 and was taken in a back area on the Somme while waiting to move forward. There is every reason to believe that these men are from the battalions of the regiment which attacked Ovillers on 7th July 1916 and suffered heavy losses in doing so, but this cannot be confirmed. They remain annoymous ‘Somme men’ who marched down the dusty lanes of France to an unknown fate and a pyrrhic victory in 1916. This entry was posted on 27/06/2012 by sommecourt. It was filed under British Army, France, Great War, Somme, Western Front, WW1 and was tagged with 1916, Ovillers, Picardy, Royal Fusiliers, Somme, WW1. My great Uncle Herbert Bowyer, served with the 8th Battalion Royal Fusiliers and was missing presumed daed following the Ovillers offensive. where can I find this photo in higher resolution and the evince that it maybe include men who attacked on the 7th? Drop me an email via the site. My Great Grandad, Private Arthur William Gibson 2786, 8th B. royal Fusiliers died 8th July 1916 age 34, its nice to think he could be in this photo. My great uncle, George Henry Scarrold, was KIA at the Battle of the Somme exactly 100 years today on the 27-7-1916….may he and all the others who lost their lives in that horrific senseless war RIP. It’s unlikely that my great great uncle was in this photo, but it’s nice to think so and sadly he didn’t last much longer. My great uncle was with the 8th Battalion, he joined up in 1914 and died on or about the 12 August 1917, makes me wonder if he was in no mans land for a while as they cant give an exact date. We have no photograph of him, such a shame, although we have managed to visit his grave in Ypres. His name was John Sweeney and he was an acting Corporal. My Great great uncle Edward Brain has been recorded as serving with 9th Battalion Royal fusiliers and was we believe KIA on the 7/71916 how do I find out more..